How do I get started? …is a question that many donor family members ask. First, think about what you may want to share about your loved one. ask a friend to help you create the square or any combination of the above! Plan to use the center portion of the square, up to within one inch of each edge. 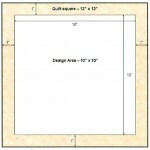 That leaves a 10” x 10” design area with a one inch border on each side. 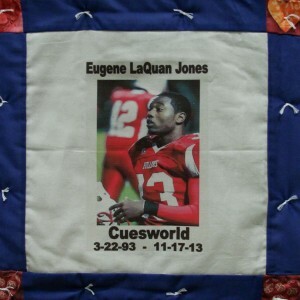 Your square will be joined to eight others, for a total of nine squares to complete each quilt. Local office supply stores can help you with an iron-on photo transfer. Your image will need to be ‘flipped’ or ‘mirror imaged’ to show correctly when ironed on the square. If you need help resizing the image and flipping it, the staff should be able to help with that. Permanent markers, fabric markers and fabric paints are widely available at local craft and big box stores – or maybe even in your own home or laundry room! 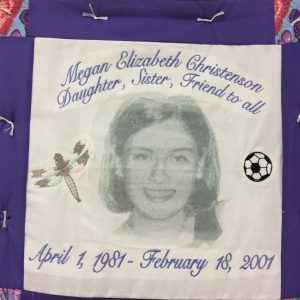 Hand embroidery and appliqué can be labors of love, but if that isn’t your interest, a local shop that does machine embroidery can help with your design. You may find an embroidery shop in a mall, or perhaps at a uniform shop or dry cleaner. 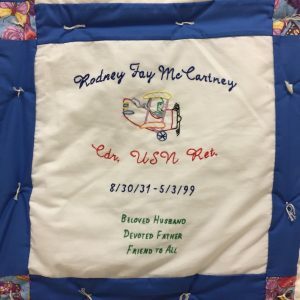 *** If you want to use a favorite fabric, badges, mementos, or a portion of a favorite piece of clothing, be sure to stitch securely to the square!! Adhesives and glue deteriorate over time. I’ve finished, now what do I do? Be sure you have secured all items to the square and have left a border for your square to be joined to the others. 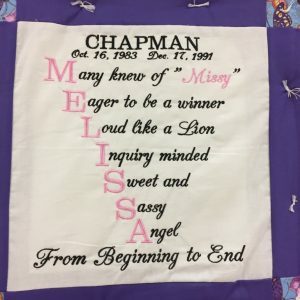 our Quilts of Love scrapbook. Carolyn Wolford at (757) 609-4671 or 1-800-847-7831 ext. 4671.